Welts are raised, red or skin-colored blisters and lesions on your skin of varying shapes and sizes. If you have a full body rash characterized by welts, you may have hives. 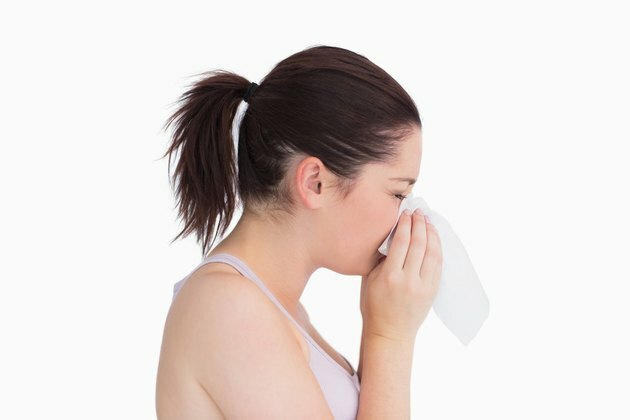 Allergies can produce hives, a condition that typically is not life-threatening; however, other symptoms of an allergic reaction can be fatal. Contact your doctor if you have hives with other symptoms, such as difficulty breathing and swelling of your throat. A common cause of hives or welts is an allergic reaction to a molecule found in substances such as food, pollen, poison ivy, soap, lotion, medicine or insect bite. When you are exposed to an allergen, your body responds to it by releasing chemicals, such as histamine. As a result, you can develop a skin rash. However, welts may result from excessive perspiration, emotional stress, extreme exposure to the sun or cold weather, autoimmune diseases, infections and illnesses, according to the PubMed Health. Symptoms of hives include the appearance of welts on your skin anywhere on your body. These can disappear and reappear within minutes to few hours and when you press the center, it briefly turns white. Hives can also cause itching and swelling of the skin, which can be very uncomfortable. Welts can become bigger or join together to form clusters along the skin, and can appear in one place or spread all around the body. If hives occurs after eating something it indicates a food allergy. Hives can even develop in your throat, leading to swelling and breathing problems. Mild hives can be left alone to heal on their own. However, you can ease the swelling and itching by avoiding showers and hot baths. Also do not wear tight-fitting clothes that can irritate the skin rash and swelling. You can also help ease the symptoms by taking an over-the-counter antihistamine pill or applying antihistamine or cortisone cream on your skin. If the breakout is severe and associated with other allergic symptoms, go to the emergency room for treatment. In most cases the exact cause of hives is unknown, according to the PubMed Health. However, if hives result from an allergic reaction, prevent a breakout by avoiding the substance that triggered the reaction in the first place. Do not take a hot shower or bath immediately after an episode because this can trigger another rash. Sometimes welts occur under the skin and cause a condition called angioedema. The causes of angioedema are the same as hives, however, it usually occurs on the face, around your eyes and lips. Angioedema can be very painful and you can help relief the pain by using a cold compress. Antihistamines and corticosteroids are also useful in its treatment.